Hi, I am interested in your 2017 Itasca Suncruiser (stock #1026719) listed on Autotrader for $192,915. I'd like to get more information about this vehicle and confirm its availability. Bedspread, pillow shams, and pillows ? TriMark? KeyOne? lock system ? Generator/shoreline automatic changeover switch ? 40,000 BTU low-profile 2-speed furnace ? Powered king bed with Ideal Rest? Natural Reserve digital comfort control mattress with remotes ? 4 deep-cycle Marine/RV sealed AGM batteries ? Corian? 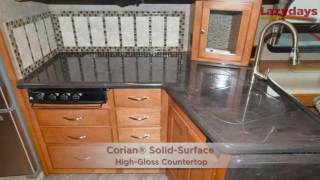 solid-surface high-gloss countertop, flip-up extension, and decorative backsplash ? Automatic dual-battery charge control ? Microwave/convection oven with range fan and touch controls ? Porch light with interior switch ? 3-burner range top with storage below ? Amplified digital HDTV antenna system ? Passenger-side curb view window ? Corian countertop with decorative backsplash ? HDMI Matrix central video selection system ? Corian sink and range covers ? Power mirrors with defrost and sideview cameras ? Blu-Ray? Home Theater Sound System ? Exterior AC duplex receptacle ? 6-way power driver seat ? Drivers side service light ? MCD solar/blackout roller shades ? Textured glass shower door ? TrueLevel? holding tank monitoring system ? Black tank flushing system ? Permanent-mount LP tank with gauge ? Powered patio awning with LED lighting and metal wrap ? Cold water filtration system ? Lower front protective mask ? MCD solar/blackout powered front shade ? Power steering with tilt wheel ? LED ceiling and accent lighting ? Entertainment center with 48 HDTV ? Front and rear mud flaps ? PowerLine? Energy Management System ? Heated holding tank compartment ? Porcelain toilet with foot pedal and sprayer ?